The University of Alabama will hold its fall commencement ceremonies Dec. 15. 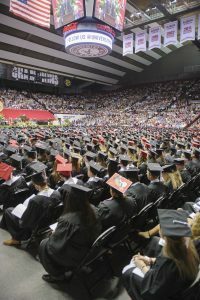 TUSCALOOSA, Ala. — The University of Alabama will hold its fall commencement exercises Saturday, Dec. 15, at Coleman Coliseum on the UA campus. UA has more than 2,700 degree candidates. Graduates will participate in two ceremonies that day, beginning at 9 a.m. with the College of Arts and Sciences, College of Education, College of Human Environmental Sciences and Capstone College of Nursing. Students in the Culverhouse College of Business, College of Communication and Information Sciences, College of Engineering, Hugh F. Culverhouse, Jr. School of Law and School of Social Work will participate at 1:30 p.m.
More information, including live webcasts details, interactive campus map, Lyft stops and lodging details, can be found at https://www.ua.edu/commencement/. Dr. Pamela Payne-Foster, professor in the UA College of Community Health Sciences, will serve as commencement marshal. Payne-Foster is deputy director of the Institute for Rural Health Research in CCHS. Her career has focused on preventive medicine, public health, bioethics and community based participatory research. Her more recent work has focused on HIV and AIDS-related Stigma in rural, faith-based settings in the Deep South.